Okay. Finally was able to do a full brew day to test out all these new toys. 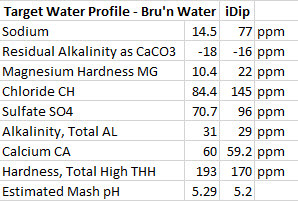 Used my pH meter for the first time with good results. Here are the what each tool predicted would be the resulting water profile and mash pH along with the results of the iDip testing tool and the pH meter results. As you can see, most of the estimates compared to the measurements were pretty close with the exception of the Sodium and Chloride. The Chloride measurement is quite troubling since it seems to be way off. The Sodium is interesting since the iDip does not actually measure the Sodium, but does a calculation of the Sodium based on the other tests performed. 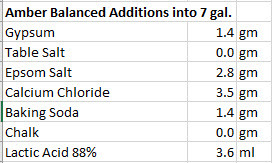 For the next round of tests, I will not use Baking Soda to see if that makes a difference on the Sodium content. I was pleasantly surprised by the pH estimates of BrunWater and BeerSmith. 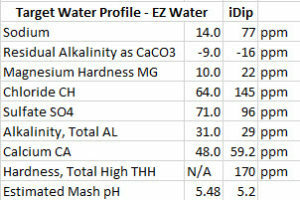 I had never added that much Lactic Acid to the mash before, but results were perfect at 5.2. 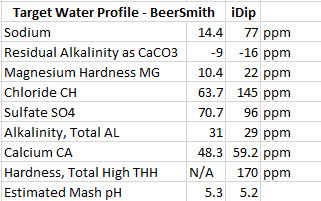 In fact, I never added much acid to the mash at all before. I plan to use the new Phosphoric Acid from Five Star next time to see how it compares to Lactic Acid.